It seems like the million dollar question lately is "When are you going to have another?". I take issue with this particular question...I mean, it took us 2 years to get pregnant with B, and then look how sick he was. Plus he's only 5 months old! When B was in Children's I asked three of his neonatologists if PPHN was genetic. All three told me no, and that any future children didn't have a higher risk of developing PPHN. So when I had my OB appointment two weeks ago, I asked him for the name of a genetic counselor. He asked why and I explained that I want to know if there is something wrong with me that caused this. We talked for about 15 minutes and he finally convinced me that there was nothing wrong. So I think I've given up on the genetic counselor. Plus, I don't even know if there are any in our area. Do any of you know of anyone who has had a baby with PPHN and gone on to have a healthy baby afterwards? Any guesses? Well, I'm sure you all got this one right...weight. Ick. I even hate the word. Sooooo, if you've ever had a c-section I think you understand when I say that c-section Mommies have a hard time losing the weight...at least in one particular area. I, unfortunately, am no different. And I'm starting to get really bothered by it. It's true that I had a 5 week delay in getting any kind of weight loss regimen started since sitting at your son's bedside all day doesn't exactly burn calories (though, I think stress does). Then, when we got home, I couldn't really go anywhere for awhile. But now, there's no excuse. Chris and I walk every night. I lift a 15lb baby alllllllll day. Why am I still stuck with the last 10 lbs?!?! AUGH. So, I need your tips, tricks, ideas and jokes (after all, humor makes everything better, right?). I am determined to get these last 10lbs off (to clarify...ahem...make myself feel better...I will say that it's not the last 10lbs of baby weight per say it's also from fertility drugs). I've been meaning to post this for awhile. A couple of weekends ago, we took B upstairs to our theatre room and watched "Bride Wars" and "He's Just Not That In To You." It's our own mini-theatre complete with a popcorn machine! I was a little disappointed in the movies. I can't wait until The Proposal comes out on dvd, I really want to see that one! Seen any good movies lately? Lately, I've had a lot of people asking me "Is B well?" or "Is B 100%?". So I wanted to take a moment and address that. B is doing really well. He is still on one medication for reflux and one prescription for his silent aspiration (the formula thickener). In September, we go back to Children's Hospital for a "swallow study." If you followed our story while B was in the NICU, you may remember that test. Basically, they take a movie x-ray and watch B swallow his formula. What they had found in February was that thin formula (water consistency) was going into his lungs, not his stomach. That's why I have to thicken his Similac. So, in September we will repeat that study and hopefully find that he is no longer aspirating. If that is the result, then he will be a "normal" baby and be able to take his liquids in their regular state. I want to add a prayer request to this post...not for B, but for a couple who we met down at Childrens named Amanda and William. Their baby Joseph was born with many, many problems. He was sent home during our 4th week at ACH, only to return a few days later as Joseph had developed RSV. They finally went home again, and now they are back. Joseph is losing weight and fighting an un-diagnosed infection. He is in isolation at this time with his very scared mother. Mom, are you getting this? Dad, are you paying attention? See how strong I am?! Standing is B's new favorite thing to do! Jumping is still a close second. I should be developing some killer muscles...haha! We got Brayden's professional pictures in a couple of weeks ago, and we've finally gotten them all framed, so I decided it was time for a mantle makeover! What do you think? I am so happy with how it turned out! I love my apothecary jars...I got them at Hobby Lobby when they were having a 50% off sale on glassware. Gotta love Hobby Lobby! Here is a picture of Chris and his boy on fathers day! I've been meaning to share that, but I didn't know how to upload pics on our new home pc. I finally figured it out though! For those that asked about the Jon and Kate divorce papers that said they've been living apart for two years...Here is what I know. TMZ said that Kate checked both boxes... that they've been apart two years and that their marriage was broken beyond repair. That way if Jon disagreed that it was broken, they wouldn't have to wait 2 years to be granted a divorce because she is claiming they've been apart that two years already. Being apart just has to mean that they've maintained separate bedrooms, not separate homes. And, she would have to be able to prove it. HTH! Did you watch last nights episode? I nearly cried. I was so sad. I actually was starting to feel over the last couple episodes that Kate had turned a corner and was making a sincere effort. I think Jon had just had enough. He wouldn't give her an opportunity. I think the way they want to handle the situation, by alternating who lives in the house with the kids is interesting. I've never heard of that before. Of course, if down the line one or both of them remarry I don't really see that situation continuing to work out. Chris actually watched the episode with me, and the only comment he made was "Looks like Jon's going through a mid-life crisis." I agree...everything about him seems to have changed. The way he dresses, speaks, his anger etc. So, did you watch? What are your thoughts? I've been gone the last couple of days. My laptop is totally on the fritz so I didn't take it with me...I will be taking it to Best Buy...wish me luck, they can be SO hard to deal with! 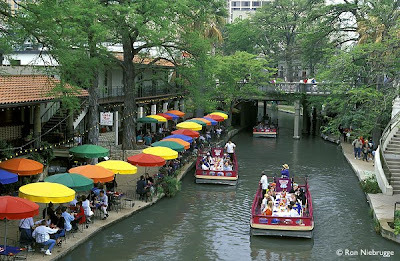 Chris and I decided to fly down to San Antonio and spend a couple of days to recoup. After I had B, we spent five long weeks in the hospital. Then we came home and he was...well, a little scary (because he was on reglan). Now, we are in a good groove. He sleeps well, he likes to travel etc, etc. He sees his Grammy (my mom) everyday so her and Granddaddy kept him while we went away for 2 days. So we just flew in today. Chris went golfing with his father for father's day and then I'm going to meet them at Guidos (pizza). I took ONE picture the entire time we were in San Antonio but I can't get it to upload! Ugh. While we were there we drove down to San Marcos (I think...it was something like that) and they had the most amazing outlets ever! There was a Saks, Williams Sonoma, Pottery Barn, Gucci, Kate Spade, Coach, Tumi and many many more! My best deal? 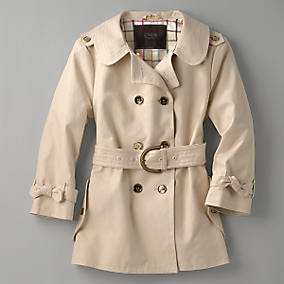 A Coach trench coat that I got about 60% off! It looks similar to this one. I think. Maybe not. But I'm pretty sure it does. Right before we left, I picked up B's professional pics that I ordered. Once they are all in frames I'll take pics and post them. If you haven't entered the giveaway (below) there's still time! I've decided to do my very first bloggy giveaway! 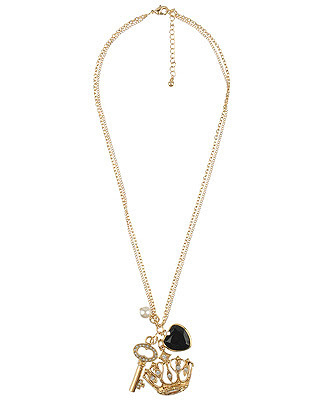 You all had such nice things to say about my jewelry palooza last week that I've decided to let one lucky winner win this necklace from Forever 21! Simply leave me a comment telling me what you'd wear this with for one entry. For another entry become of follower of my blog! If you do this, make sure to leave me a note in the comments so that I know to count you in for 2 entries. A winner will be announced on Monday! Got more Driving 101 tips? Keep them coming on my last post! I think some of my fellow drivers need a refresher course. Here are a few tips (you know, just in case they are reading) for them. - A turning lane is just that. A turning lane. Not a cruise for the next three miles lane. Certainly not a passing lane. Just a turning lane. - If a speed limit sign says "50 mph" then at least do 45. And if you still can't swing it, then please, please, please get in the slow lane. - Unless there is a stoplight at the end of the freeway entrance or traffic is stopped, don't stop. You have that whole time to be checking for on-coming traffic. MERGE!!! - If you are an experienced driver/texter, then by all means. However, if you can't do both at the same time, DON'T! - There are two lanes because it's okay for people to be in either one...you can't be in BOTH at one time unless you are changing lanes (that to the person I followed for well over a mile driving in the dead center of the road!). Ahh. I feel better now. Got any driving tips to add? My big boy is 5 months old today! -We have a favorite food! Freshly mashed bananas...yummo. - You LOVE to talk. You often attempt imitating sounds, your favorites being "oh" and "hi." - You startle easily. Which can be funny as long as you don't cry! - You want to hold your bottle but you still aren't coordinated enough! - You sit up for a couple minutes at a time. - You HEART your FEET! - You're shy!!! If someone new talks to you, you hide your face in my shoulder! I love it! - You are just like Daddy...you like staring at yourself in the mirror! Ha! - You are still in love with your jumperoo. - You think Mommy is your own personal gym when we are out. You are SO strong! - You love watching TV, but how could you not? You are our son! - You're still a great sleeper. Every night you are asleep by 9:10 and you sleep until at least 7:15. - You smile more than any baby I've ever met! You are so happy! - You are a sound sleeper...you slept through an entire thunderstorm that woke both Mommy and Daddy up! One and a half ice cube trays. I'd say they hold about an ounce each...maybe...maybe not. I've never been good at guessing that kind of thing. I'm the person who puts leftovers in the biggest tupperware I have. So to make this lovely concoction, I steamed the potato, then pureed it in my mini food processor (not my big one) and added water as needed to get the consistency. No, I'm not joking. Seriously, what is the world coming to?! This is it. I think. If memory serves, then that's what it looks like. It is just in the other room, but I'm quite comfy where I'm at and I think I'll pass on the idea of getting up to hunt it down. So, there are lots of knobs on it. With numbers. And symbols. Oh and some funny shaped letter things. No idea what any of it means and because my husband seems to be a believer in the manuals are for wimps idea...well, you can see why I don't know how to work the thing. Here's what I can do...turn it on. 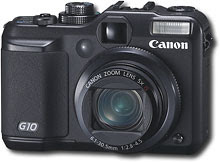 Point and shoot. Take a movie. Review pics. Upload pics. That is all fine and good but I am fairly sure that those symbols, numbers and funny shaped letter thingys must mean something about the quality of the picture I am taking. Any thoughts? Perhaps you can de-mystify the funny shaped letters? Go HERE to read an interview with Beccah Beushausen...aka "B." or "April's Mom." Today Miss Harper finally met Mr Brayden...kinda. Kelly and I went to lunch to let the miracles meet but they both slept through it! This pic (which I stole from Kelly because I forgot my camera) was right as we were about to go our separate ways and B woke up. You can tell he's a little grouchy! He's not a fan of waking up in his carseat! It was nice to be able to talk to someone who knows what it's like to be a momma to a NICU baby. We both missed a lot of special times with our kids that most moms get to experience...from just holding them when they are born to taking a normal first car ride home...things most people wouldn't think much about. Tonight Chris and I went to PF Changs because I am quite possibly addicted to Kung Pow Chicken (I am fairly sure I spelled that wrong). So Yum. Please continue to pray for Avery - her link is on my sidebar! Thanks! I call him my big sitemupperman! He can sit without falling over to the side for 30 seconds to a minute now! Last night he was in the mood for a book...he was so enthralled I didn't bother to turn it around for him! And here he is playing on his back. Just too cute for words! He looked longer to me so I measured him but he's still 25". He's still weighing around 14lb 5oz probably because he is so active! He practically lives in his jumperoo when were at home! He adores it! Well, I've looked at the blogs and everything related to the April blog. Here are my thoughts. I think it is all very confusing. I refuse to pass judgement on the situation because a) it's not my place and b) it is the internet and yes things can be doctored but they can also be real. Truthfully, people could have said what I was going through with Brayden was a hoax if they wanted to, because people can say anything on the internet - or so it seems. If it is a hoax then I'm obviously very hurt, as the mother of a NICU baby and just as a person who was praying for them. If it isn't then I hope and pray they havent been too negatively affected by what's going on. In any case, whoever is behind this blog needs our prayers. Feel free to leave me your thoughts and comments, as I of course read them. Hopefully tomorrow we can talk about something upbeat! I have an idea but I am still working on how to work it out....so stay tuned. I've read the comments about this being a hoax and when I get back this afternoon, I will read through the blogs and give you my take...whatever that might be. I've received a lot of emails asking me about April Rose, so I am going to do my best to fill you in on what I know. I don't personally know April or her family, but I've avidly been keeping up with the blog. I still have my window open on my computer that has her birth story, so I am going to give you a brief synopsis of what happened. Later yesterday "D" posted and said that he was taking everything down because of the large amount of hate mail they had received. He did say that they would give updates on April but when I checked this morning the whole blog had been disabled. So that is all I know. If the blog comes back up, let me know! I decided to get the Maclaren! We went with the Quest and after checking out our local retailer, I found the exact same, brand new, in the box stroller on ebay for over $100 less. When I was in the hospital after having B, my brother brought me a bear he built for B at Build A Bear (which is so out of character for him, so it was really sweet!). The little aviators were on the bear so I put them on B man for our walk last night. He really liked it! And last night, here is my Big Kahuna sitting up! He can't do it for very long but I'm still counting it! Yes, that is Daddy's hand behind him, but he isn't holding him - he was there just in case! Keep the comments coming on my last post! I'm loving your ideas! Ok, maybe I should call it my Kris Allen hearing...but I didn't want you to think he was on trial or something. So last night I was with Chris at our local country club and he was at the driving range. I drove B around the neighborhood for awhile because he was asleep and then I went to check on Chris. Though I am a horrible golfer, he's taught me a lot and I help him with his swing (not that he really needs my help...he's really good at golf). So another man was there hitting and he started talking to us and we found out that Kris Allen was at Pinnacle doing a private concert for some Wal-Mart execs (for those Non-NWA'ers, it's Shareholders here for Wal-Mart which means lots of celebs are in town for the meeting and for concerts). So I got to hear him sing "Heartless" (awesome...so much better than the original) and a Michael Jackson song! Too cool! We were tipped off that if we drove a golf cart around to the 18th hole that we could have seen him but then I would have been late for dinner with my BFF Amy. 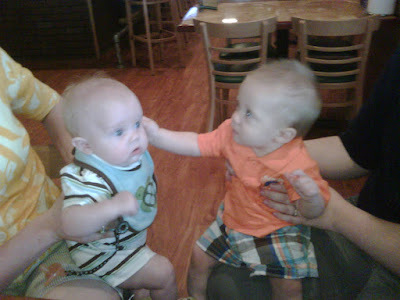 Brayden got to meet his BFF last night, Landon! He'd never been up close and personal with another baby and he wasn't sure what to think! 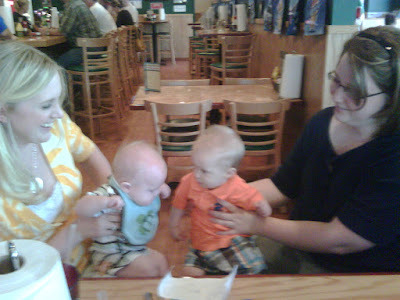 Landon loved him, it was SO cute! He got very excited when his Daddy Trenton was holding him and kept trying to escape and see B! At first B avoided eye contact and then he started smiling. It was so precious! I can't wait to have our first playdate! So you don't have to be a mom to answer this question. If you plan on having kids you've probably thought about your food choices for them. I knew that I would be a formula feeder (and it turned out it had to be that way anyway) and that I would start him off with rice and then move into the stage one foods at about 4 months. 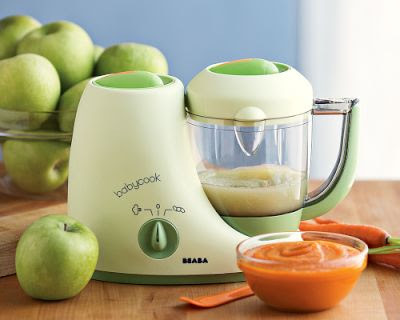 Williams Sonoma sells this baby food maker called Beaba Babycook. It's a steamer, blender, warmer and defroster all in one. It cooks and purees everything in 15 min's or less. It's got a lot of pluses in my book, the biggest being that I would control the quality of the food my baby gets. It's pretty expensive though. So will you/do you make your own baby food? Do you have something like this system? I'm thinking of switching to steaming fruits and veggies and blending them in my blender or food processor for B. Right now he gets Gerber Stage One foods. And yes, this is my SECOND post of the day...Wow. If you missed the giveaway post, it is just below this one! So I've heard that Madsen is doing a giveaway. 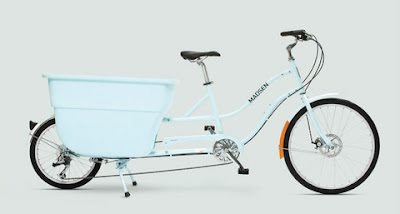 If you aren't familiar with them, click on the pic to the right of this post to learn about Madsen products and to enter the giveaway yourself! Now I'm not sure if you live in Arkansas how up your alley this is, but I think my California readers will dig it! In any case, they are pretty neat. Of course, if I win, I will be the one riding this bike. Why won't I share with Chris? Well, I would but my hubs doesn't know how to ride a bike. He'd be thrilled that I am telling you all this. When we were first dating I attempted to show him how. I held onto the back and helped him get started but he fell over and now he won't get back on it. So if I win, I think I'd like the blue one. If you win, what color would you get? Yesterday was a better day. My mom was able to get B to take a nap (YAY). Last night he woke up a couple of times "talking" and I just let him talk his little self back to sleep. During nap time I was able to do my favorite thing...bake! I made chocolate chip cookies and also cooked a pork loin for dinner. So good. This morning (like 10 mins ago) we decided to try out carrots. B kept making this hilarious face because he apparently hated the carrots but everytime I would take his picture he would smile. What a ham! It doesn't look so nice outside so I think B and I are going to stay in today. Hopefully I will be able to get him to take a nap! Edited to add - I keep forgetting to mention this but a couple of weeks ago it seemed like B was suddenly aware that his name was indeed, Brayden. Now every time we say Brayden he looks at us! It's so neat to know that he knows his name! Booboo was NOT a happy camper. At all. ALL DAY. I really don't know what is wrong. I think/thought he is teething but I thought for sure that the suspect tooth would have come in by now if that was the issue. He woke up at 5am (sorry Daddy, it was your day!) screaming. Chris thinks I jinxed him. I have a bad habit of this. I always say things like "You know, B hasn't woken up crying in over a month!" so of course you know the very next day he wakes up crying. He didn't take one, single nap ALL day. Scary. I took his temp a billion times, checked his gums, gave him his frozen teething ring, put him in his walker, bouncy, jumperoo, superseat and swing. The only thing that mildly worked was the jumperoo. It was a long day. I ended up putting him in his crib last night WIDE awake. He's always asleep when I lay him down. The good thing was he eventually did put himself to sleep. It only took maybe 30 mins but it's good to know that he can do that. He woke up this morning at 6:50. Hopefully today is a better day!